Structured Data, Schema, and Rich Snippets—Oh my! As much as the internet seems like the wild west on the surface, below are highly structured pathways, organized notations, and rules. Keep in mind this was not always the case. There was a time when the internet was roiling with a different concept of organization and how users would find information. The early chaotic stages of the internet created sly marketing strategies, like keyword stuffing or link schemes. Thankfully, companies like Google and Bing have provided guidelines and rules that have put an end to the chaos. Now, search engines give webmasters and marketers the knowledge and rules to properly market their company through search engines. Ultimately, companies who follow these guidelines and transparently provide information are rewarded with high visibility through search engines. With search engines being the number one information gathering tool on the planet, having high visibility can be an extremely profitable marketing tactic, which we call Search Engine Optimization (SEO). Google and other search engines decide what websites deserve to be on the top of a search query by using information their spiders provide. These spiders crawl every website on the internet and document the information on each page, how well it’s organized, and how credible it is. There are thousands of factors that help search engines determine how credible a site is, and we don’t know them all. Only the Google lords know that. But, what we do know is that these spiders enter a website, reading all of the code (HTML, CSS, PHP, etc.) looking for page titles, topic points, and keywords. Without any other SEO strategies being implemented these factors are the main way Google ranks website within a search query. As of October 2018, 43.1% of all websites on the internet are using some kind of structured data on their website. More importantly, nearly 50% of your competition might already be using structured data, moving them higher and more visible to potential customers’ search queries. Structured Data is a way of structuring data snippets so that Google and other search engines can better understand the content of your page. It is created using JSON-LD and will look like a text file of the important ideas on your web page. For instance, if I wanted to tell a search engine the basic information for who and what DVS is, I would use the following Structured Data Snippet. This snippet of JSON-LD lets search engines know how to get to our website, the company logo, our contact information, what our company is, and when we are open. This is a fairly basic snippet, but already it is supplying search engines with a great deal of information that is then presented to the user without having them ever click into your website. Rich Snippets refer to enhanced search results snippets. These snippets stand out from common organic results because of their visual appeal and additional information, not to mention the amount of space they’ll take up if the structured data is properly implemented. Most rich snippets push other results below the fold, making them the prime source of information for users. Keep in mind there are hundreds of ways that search engines can display Rich Snippets’ enhanced results, all influenced by the Structured Data of a website. Unfortunately, it is not guaranteed that every search query will have a Rich Snippet when linking to your site, especially if your site is not the top result. All the more reason to combine Structured Data efforts with other recommend SEO tactics. At the end of the day, no matter the case, the purpose of SEO is to engage with search engine users who are actively searching for the information that your website offers, period. We call that inbound web traffic in the digital marketing world. Through the provision of information, a website can generate leads and convert sales for a business. This is a concept that has honestly taken the world by storm—a person looking for a product, service, or information turns to a search engine. With that, there are now 40,000 searches per second on Google, each producing thousands of pages of results. More importantly, 75% of users never go past the first page of those results. Structured Data ensures that your site populates in the results that you desire, and highly targets your SEO efforts. Rich snippets give search engine users more information upfront, increasing the chance they’ll find your snippet more informative than your competition, and more than likely enter your site. Ultimately, all of that increases a business or organization’s chances to interact with online users, create more leads, and drive more sales. 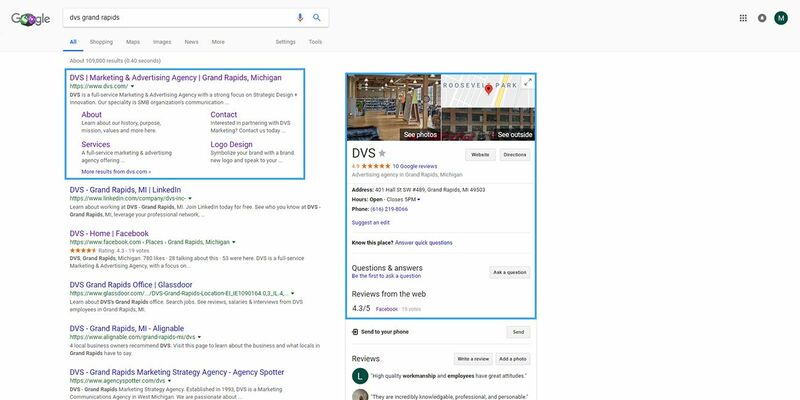 If you have any additional questions about Structured Data, Schema, or Rich Snippets, contact DVS today.